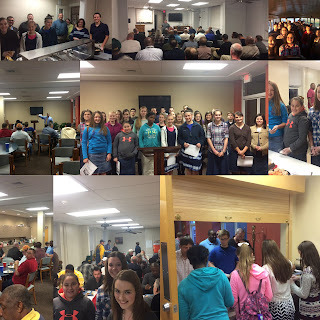 Tonight, it was very exciting to see our teens go into the Winston-Salem Rescue Mission and really make a difference! As soon as we arrived, they jumped right into action! Our girls began pouring drinks and getting desserts ready as our guys went out and made sure the men in the mission had everything they needed. The residents then went through the lines and were served a great meal by our teens. After the meal, our youth choir sang several songs before the preaching in services on two parts of the campus. At the end of the night a man came forward and accepted Christ as his Savior! William Booth said, "You cannot warm the hearts of people with God's love if they have an empty stomach..." If our teens had not lovingly served a meal and joyfully sang in the choir, this man may have never heard the Gospel and accepted Christ as his Savior! Parents, as hard as it may be to believe at times, your teen can make a difference! That son who won't make his bed or daughter who never seems to put her cell phone down is quickly reaching adulthood and can serve God in a great way. It is important to cultivate a passion to make a difference within their heart. Our goal, as a church, is to assist you in training your teen to Honor God, Build Lives, and Reach Others! Tonight, I believe our teens did just that! Teens Can Make A Real Difference! Copyright The Calvary Connection | Designed by VeeThemes.com.